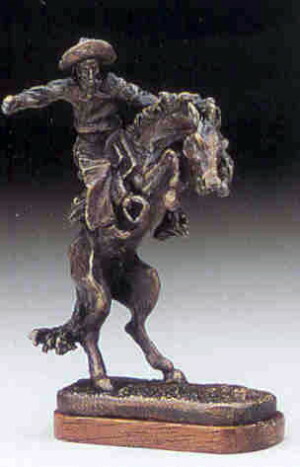 This is an interpretation in miniature of a figurine cast in bronze by Frederic Remington, cira 1895. His first endeavor in sculpting, it also is the first Western bronze casting of a rider on a bucking horse. Today this subject has come to symbolize the West. The studio interpretation, at 1 5/8 inches in height, shows all the energy of Remington's landmark casting.